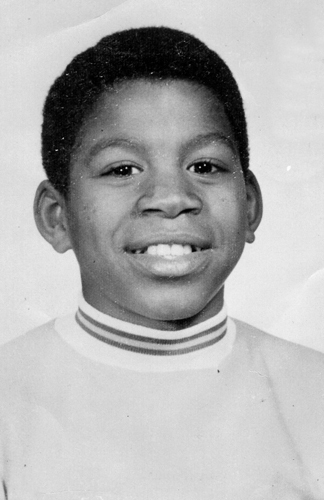 Earvin Johnson Jr. was born to Earvin Sr., a General Motors assembly worker, and Christine, a school custodian. Johnson grew up in Lansing, Michigan, and came to love basketball as a youngster, idolizing players such as Earl Monroe and Marques Haynes, and practicing "all day". Johnson was first dubbed "Magic" as a 15-year-old sophomore playing for Lansing's Everett High School, when he recorded a triple-double of 36 points, 18 rebounds and 16 assists. After the game, Fred Stabley Jr., a sports writer for the Lansing State Journal, gave him the moniker despite the belief of Johnson's mother, a Christian, that the name was sacrilegious. In his final high school season, Johnson led Lansing Everett to a 27–1 win–loss record while averaging 28.8 points and 16.8 rebounds per game, and took his team to an overtime victory in the state championship game. Earvin Johnson, Jr., grew up with nine siblings, but Junior was the one who usually slept with his basketball. He dribbled it on errands to the store, and developed into a real player. A local sportswriter dubbed him "Magic" after watching Johnson dominate a high school game. His mother disapproved, thinking the nickname sounded blasphemous. Johnson had an uncanny ability to see plays before they developed, passing the ball cross-court to players who weren't there yet, but would be by the time the ball arrived. The term "triple double" (for a player whose points, rebounds, and assists reach double digits in a single game) was coined largely for Magic Johnson, who did it routinely. He played guard, center, and forward. Earvin Johnson Jr. was born on August 14, 1959, in Lansing, Michigan, the fourth of Earvin and Christine Johnson's seven children. His father worked at an auto factory during the day and hauled trash at night to make extra money. Earvin Jr. worked at several jobs, including helping his father, but his first love was basketball. In 1977 Johnson and his Everett High School team won the state championship. His passing and ball-handling skills won him the nickname "Magic." He then attended Michigan State University. In his second year, Michigan State won the national college basketball championship by defeating Indiana State University, a team led by future Boston Celtics star Larry Bird (1956–). Johnson scored twenty-four points and was chosen Most Valuable Player (MVP).